75,000 digital radio listeners in Scunthorpe received a digital boost this morning with the launch of a new transmitter bringing them their favourite local radio stations on DAB digital radio for the first time. BBC Radio Humberside’s David Burns will broadcast his mid-morning programme live from Café Indie Pendent in Scunthorpe between 9am and midday, with Nic Dakin, MP for Scunthorpe, and long-term listener, Meg Smith, pressing the big green digital radio switch at 10.30am live on air with Burnsy to mark the moment the transmitter launched bringing local services on DAB digital radio to 74,000 listeners in the region. Listeners in Scunthorpe can now receive 11 services on DAB digital radio - BBC Radio Humberside, Capital Yorkshire, Viking FM, Viking 2 and Viking 3, Smooth, Absolute Classic Rock, Absolute 90s, Gold, Kiss Fresh and Magic Soul. Scunthorpe United supporters will also be able to listen to BBC Radio Humberside’s live commentary on some games on DAB digital radio. The Scunthorpe transmitter is the final of five new transmitters which have been built to expand and boost local DAB digital coverage for over 220,000 listeners in Northern Lincolnshire and East Yorkshire, taking local DAB digital radio coverage up to 98% of households. 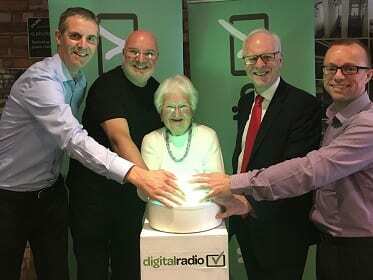 The five new Northern Lincolnshire and East Yorkshire transmitters have been built by communications infrastructure company Arqiva, are part of an industry and Government programme of work expanding the coverage and listening to DAB digital radio. Government, BBC and commercial radio are near completion of a further 182 local DAB transmitters to extend local DAB coverage to more than 91% of the population bringing eight million listeners across the UK into coverage and adding over 4,160 miles of roads.